The day before his last home match for Munster, Paul O'Connell was asked whether he wished he was a few years younger so he might knock a few more years out of it. O'Connell replied that he instead wished he was a few years older so that he might have played in the glory days of the AIL. My Dad would have been going to all the AIL games. The AIL was the real thing that I grew up with. And in some ways, it's not a regret because you can't change your date of birth, but I would have loved to have been involved in the real glory days of the AIL in the mid-90s. Those are probably my first real memories of where the guys that became heroes for Munster, like Foley, Quinny, Wally, yourself (Marcus Horan was the interviewer), Hayes, all those guys, would have become legends in Limerick long before Munster took off. As Anthony Foley told former Shannon and Munster full back Pat Murray, when the AIL was finally founded in 1990 it was assumed that the likes of Ballymena and Blackrock would rule the roost. In fact, in the first nine years of the competition, every year it was played in 1990s, the trophy never left Munster. It rarely left Limerick. Cork Constitution won it twice, in 1991 and 1999. In the seven years in between, it was Limerick all the way. As a result, Limerick rugby supporters were especially aggrieved when Irish team selections were announced. They found it exceptionally hard to get players in the team. Former Irish Independent columnist and Leinster rugby fan, Dave Robbins acknowledged a certain bias a few years ago. Yes, Munster had been hard done-by in selecting the Ireland team back in the days when the starting XV were scribbled on the back on an envelope in Paddy Madigan’s pub in Donnybrook. The team seemed immutable; the joke was that it was harder to get off the team than get on it. In a video tribute screened at a dinner honouring former Irish outhalf Mick English, Richard Harris - as true a Limerick rugby man as has ever existed - expressed his dissatisfaction. His advice to anyone wishing to play for Ireland was simple. Move to Dublin and join Lansdowne. As Mickey English had done. Harris didn't think to enlist Munster's Heineken Cup performances in his argument. Munster weren't exactly pulling up trees in Europe at that point but they had notched a couple of big wins in Thomond and were performing better than the other provinces - Ulster wouldn't win it out until the following year. But as late as 1998, Harris still thought in terms of the AIL. "I'VE MY CAP TO THINK ABOUT NEXT WEEK..."
Foley was bizarrely out of favour with the Irish management at the time Harris delivered his rant. But he had already made his Ireland debut in 1995. It was the first game of the 1995 Five Nations and Ireland were gunning for a highly unlikely three-in-a-row over Will Carling's intimidating England team. Had it been achieved, it would certainly have been the most bizarre three-in-row sequence in rugby history. England, under new coach Jack Rowell, formerly of Bath, beat Ireland 20-8. We couldn't replicate the shock wins of 1993 and 1994. They went on to complete the Grand Slam. But Foley enjoyed a positive debut against his opposite number, the legendary Dean Richards, then untainted by any incidents with blood capsules. The only black mark hanging over Richards at that time was the story of his drunken antics on the Royal Mile with the Calcutta Cup trophy after the 1988 Scotland-England match. The trophy still bears the scars. Foley scored a late try in the corner to add respectability to the scoreboard. He also got involved with his opposite number at a lineout, aiming an elbow at him. Elder statesman Richards told him to "calm down, young man." Richards it was who was responsible for giving him the nickname 'Axel', inspired by a mixture of Eddie Murphy and the Irish 8's excitability. Foley broke a custom the week before his first cap for Ireland. It was considered traditional for debutants to sit out rugby the Saturday before their first cap. The Irish management, with Noel Murphy at its head, and the club hierarchy at Shannon were singing off the same hymn-sheet. Even non-first cappers occasionally opted out of club duty, usually with everyone's blessing, when they had a big international match coming up. Around this time, one player for a Leinster-based club sat out his side's AIL game on straightforward grounds. "I've my cap to think about next week," he explained. His team lost. But Shannon were chasing the AIL title and had a big game against Blackrock at Stradbrook. Foley also had "his cap to think about" the following week. But he put it to one side and played the Shannon game. By all accounts, he was outstanding. This isn't romantic Munster hyperbole. "It showed his commitment to the club and gave us a belief that we could go out and beat Blackrock," explained coach Niall O'Donovan. Needless to say, Shannon won the match thanks to Billy O'Shea's foot-rush try. From there, they kicked on and won their first AIL title. The first of four in a row. Foley didn't miss a single match of Shannon's four-in-a-row run. "I TOOK A LONG HARD THINK ABOUT IT. IT LASTED ABOUT 15 SECONDS AND I DECLINED"
In his late teens, Garryowen's AIL winning coach and future Irish coach Murray Kidd tried to get Foley to switch allegiance. I took a long hard think about it. It lasted about 15 seconds. And declined. Everybody is born into a club in Limerick and that's the way it is. In our generation, that's the way it was. In our generation, that's the way it was. Now there's chopping and changing. His father Brendan, Irish international and Munster legend, conqueror, along with fourteen others, of the All-Blacks, played for Shannon in the 70s and 80s. Young Anthony used to go along to the games. He was one of those kids who used to hang around dressing rooms. He used to lug around his Dad's gear-bag. Interestingly, at age 4 and a half, his mother stopped him going to the Munster-All-Blacks game out of fear of the crowds. To this day, he is one of about four people alive in Munster at the time who wasn't at the game. And the other three are less forthcoming about it. "I'm probably one of the only ones saying I wasn't there," acknowledged Foley. But the run-of-the-mill Shannon games, he was always there. It was obvious that he was going to play for the club some day. Prior to the 1990s, there was no national club competition in rugby union in Ireland. The organisation of rugby union was far too shambolic to dream up such an outlandish scheme. The Munster Senior Cup was the blue ribbon event for Limerick clubs. Games between inter-city rivals always attracted big crowds. This didn't diminish when the AIL came along. If anything it intensified. There was the added incentive of stuffing the sides from capital. The dreary inter-provincial championship stirred up nothing but apathy. The crowds were pathetic and the briefest of highlights would be shown on Sports Stadium. By contrast, the All-Ireland League caught on in a big way, none more so than in Limerick. When Munster first dipped their toe into this new-fangled European Cup competition against Swansea in Thomond Park in 1995, all the chatter on the terraces concerned the previous weekend's round of AIL matches. Those who attended only did so out of mild curiosity. Historian Liam O'Callaghan was at the game. There were a few thousand at it, there was no real fuss about it, and everybody in the crowd was just talking about the club fixtures of the previous weekend. This Munster thing was just a gentle distraction from the much more important business of AIL fixtures. Cork Con won the inaugural AIL in 1991 and after that Limerick established a stranglehold. Garryowen, under coach Murray Kidd, and with Keith Wood in a starring role, won the 1991-92 competition. That season, they played Shannon in Thomond Park in front of 15,500. The following season, generally held to be the high-point of the competition, Young Munster beat St. Mary's 17-14 in front of 18,000 fans in Lansdowne Road. Ger Earls intercepted a loose pass and ran the length of the field to score the winning try. St. Mary's back-row Brent Pope was sent off for an off-the-ball incident. 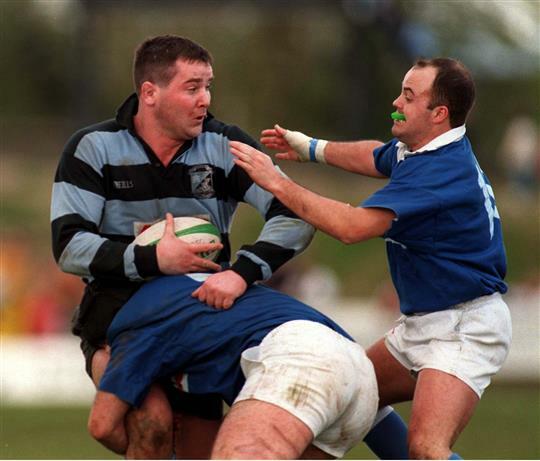 In 1993-94, it was Garryowen again, holding off a spirited challenge from an Eddie O'Sullivan coached Blackrock, who had the stylish Brendan Mullin playing some of the best rugby of his career. The Dublin clubs were consistently having to play second fiddle. The perception was that the Leinster teams were victims of their own determination to play fluid, attractive rugby. They were suffering for their art. The Limerick clubs, so it went, were less moralistic, more hard-nosed, less squeamish about playing pragmatic rugby, and that's what always won out in the end. In the 1994-95 season, Shannon got in on the act, winning the League title by six points from Blackrock. Over the next few years, Shannon established a dynasty that remains unmatched in Irish club rugby. And they were to have a seismic influence on the successful Munster team that captivated the nation. The personality of that Munster side was forged in the AIL, and Shannon were its greatest team. Several of their players, while not widely known outside Limerick for their exploits with Shannon, were soon to become known to the wider public. Mick Galwey, second row on the four-in-a-row team, told us last year how he once played in a Shannon club side that contained seven internationals. I played in a Shannon pack one day that included seven players that went onto play for Ireland. I look at my club days, Marcus Horan, John Hayes, myself, Eddie Halvey, Alan Quinlan, Anthony Foley, you know, we would have all come through the Shannon-AIL days... That was their grounding, that was where they learned the trade to play rugby. Tom English, BBC journalist and the author of 'No Borders: Playing Rugby For Ireland', spoke to us last year about the relative decline of the club in Munster and its implications for the future. He regards the Munster team that emerged in the early noughties as a "once off" and he cited the importance of a vibrant club scene in moulding the team into what they became. If you look at the great players, their values came from their clubs. Foley was captain for the final instalment of the four in a row in 1997-98, the first season in which the competition was decided via a playoff. Before that, it had been a straight League. Pat Murray, the man who scored the winning try in Munster's first ever Heineken Cup game, was captain for the first three of those successes. He retired in 1997 and coached the team the following season. The identity of their opponents underlined Limerick's dominance in the club scene. A fair chunk of the city population traveled en masse to Dublin to watch Garryowen attempt halt the drive for four in a row. Standing alongside Foley when he hoisted the Cup into the air was Alan Quinlan. As they belted out the club anthem 'There is an Isle', the camera pans out and you can see John Hayes and Mick Galwey in the picture. They're clasping jerseys and they've their eyes wedged shut like Christy Moore. At the time, the national team were struggling badly. That was the last year Ireland was to receive a belt of the wooden spoon. It was a proper wooden spoon too. They didn't sneak a win in Cardiff and miss out on the holy grail of second-last on points difference. They were whitewashed. None of those Shannon players were anywhere near the Irish team. Within a couple of years, the guys mentioned would be ushered into the fold, some for the first time, some returning from their strange exile. It may be no coincidence that Irish rugby soon headed for sunnier climes. Anthony Foley's biographer Peter O'Reilly said that Foley had a very clear sense of the importance of the AIL to the revival of Irish rugby in the 21st century. Part of the reason why he's remembered so fondly in Irish sport, is that there's an understanding of where he comes from which is the club game. His roots are in the Munster club game, with Shannon especially. And the joy of working with Anthony on the book was that he had a real sense of that narrative because he was so close to his father's playing background... He was very aware of his roots in the club game and the fact that it was the club game and the AIL in the 90s that laid the foundations for success for Munster and then for Ireland.